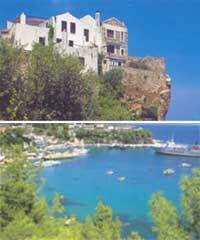 Calmness characterizes Alonisos, one of the first islands of the Aegean that were lived. The old houses of Palia Alonisos, that were restored, impress the visitor. In the paved paths and the beaches of the island, is developed a tourism that is friendly to nature. In the wonderful natural environment of Alonisos the visitor has alternative options: walking, fishing, sailing, visiting the National Sea Park,etc.